Some friends of mine were asking me about the best way to see Vienna as a tourist. How to find something ‘other than classical music and Schnitzel’. Slightly outraged on my adopted city’s behalf, I replied that there is a huge variety to Vienna, you just need to know where to look! 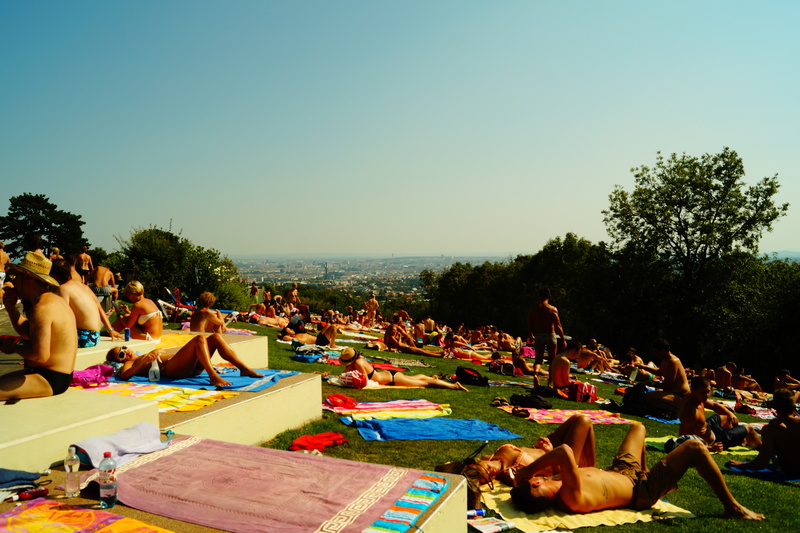 So, to prove the many wonders of this incredible city, I devised a plan for a Weekend in Wien…. 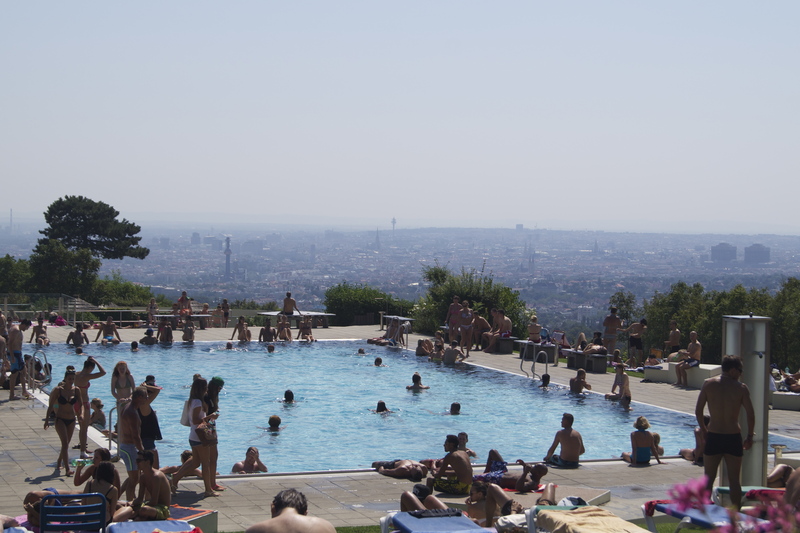 Krapfenwaldbad has incredible views over the city of Vienna, being perfectly placed near the top of the Kahlenberg Mountain. There are multiple swimming pools, the main one being nicely deep & cold for swimming . Don’t expect anyone to be doing laps though, this is serious ‘see and be seen’ territory for the young trendy locals. It’s also relaxed enough that you can while away the day in relative peace. There’s an on-site cafe & bar too, so any and all your chill out needs are attended to. Plus, did I mention the crazy awesome views? That’s all of Vienna at your feet! Ok, now that you’re relaxed after a day spent poolside, let the tourist activities begin! First, there’s some really excellent gardens to spend a morning roaming around…. That little building up top is a Gloriette, where Emperor’s have breakfast – ‘cos being an Emperor is kickarse! 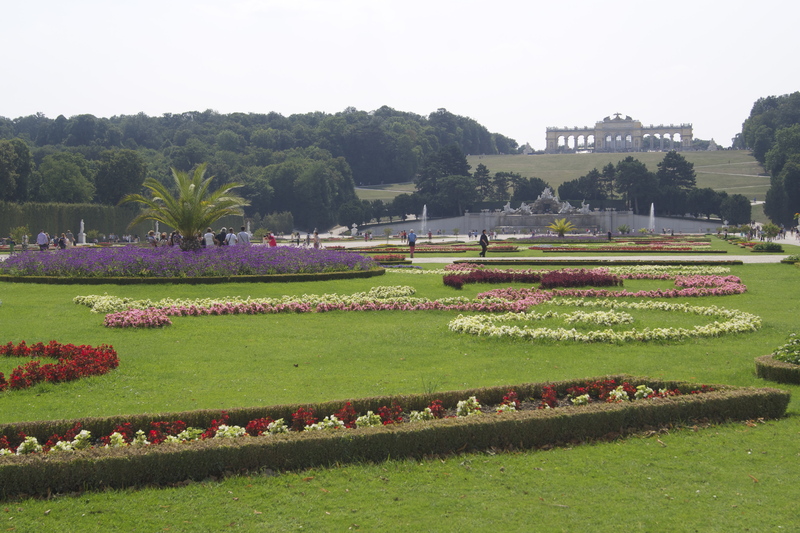 …which are conveniently attached to the glorious Schönbrunn Palace. Schönbrunn was the Habsburg’s Summer Palace, which, when you see the size of it, tells you just how awesome it was to be Royalty in the Golden Age. The best Apple Strudel & Iced coffee in Vienna can be had in the cafe to the left of the entrance – trust me I have done thorough research on this. Once Schönbrunn has been conquered, you may find yourself in need of a drink, or just a change of location for further drinks- based activities. 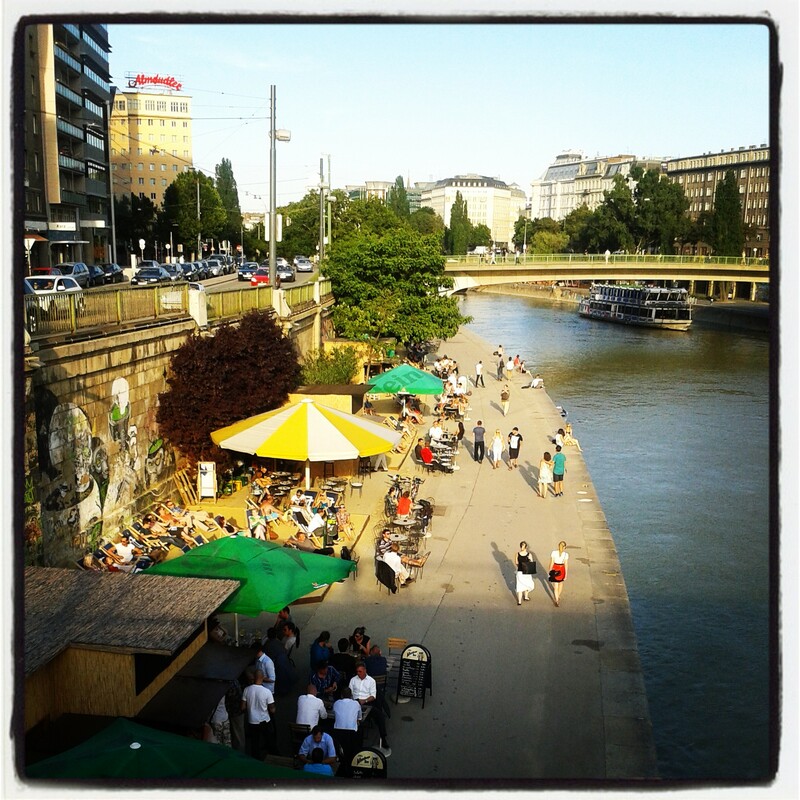 The über cool Donaukanal is the perfect location. 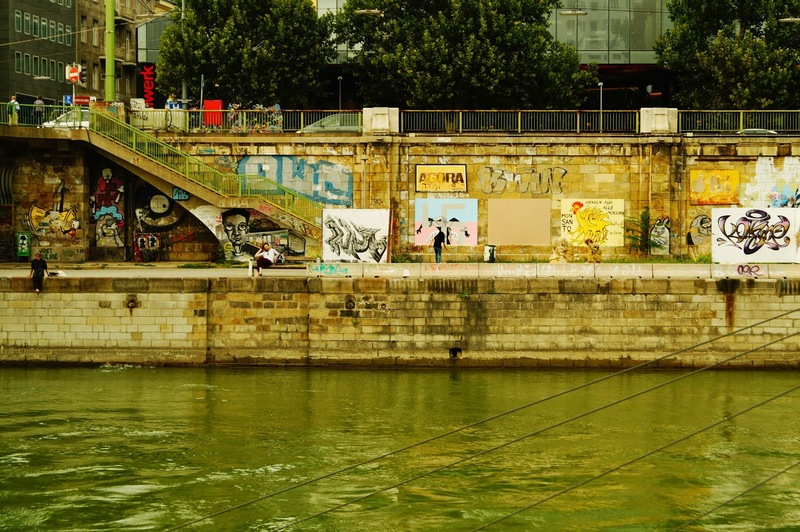 Wander down the canal steps from the city centre and you’ll find brilliant street art, a huge choice of bars, pop-up shacks selling different food & drink, all nestled beside the gorgeous Danube Canal. ‘Beach’ Bars – bit different to beaches back home!! With some slightly younger specimens in front of it. That up there is the Prater Turm, which I absolutely refused to go on, right up until I was strapped in. It was at once terrifying and beautiful – at 117m, this is the world’s highest flying swing. The pay-off you get for braving it is stunning views over all of Vienna. It only gets nauseating on the way down, when, near the bottom, they speed up the pace of the chairs swinging in circles. But if you can stand that for 2 minutes, the view is well worth it! Super cute old fashioned token to ride! 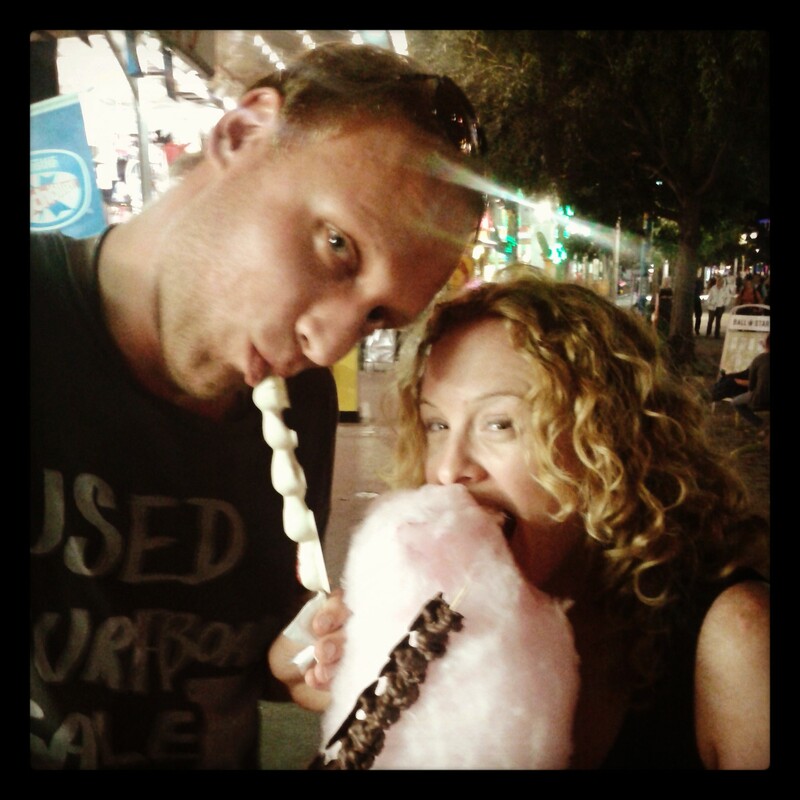 After all that adrenelin, rounding out the day with a sugar hit is highly reccommended. Fairy floss and chocolate fruit on a stick = heaven. Exhausted yet?? Well stay tuned…part two of your awesome Weekend in Wien will be posted next! I’m in Vienna every few weeks, thanks for this posts. I’ll visit some places. Anyhow, you make my heart ache for Vienna…living in the sterile US..
I´ve been several times to the places you tell about. It´s really refreshing to see those spots through the eyes of a “newbie”! Love the stories! I like your postings about Austria (Vienna) – don’t mix the 2 up, they are very different – very much. What is missing is something about Italian ice cream in Vienna. If you need some advice, I think I am an expert. Hello from a fellow GGI, and Aussie expat. I loved reading this! isn’t it funny how all of the beaches in Europe are so different compared to home. I am still getting used to the rocks beneath my feet and not the soft (albiet boily hot) sand. I think that’s one of my biggest summer ‘challenges’!! And sunbaking with stones beneath you isn’t quite the same….but using the bannana lounges instead is a nice soloution hahaha 🙂 Thanks for reading and adding the blog! 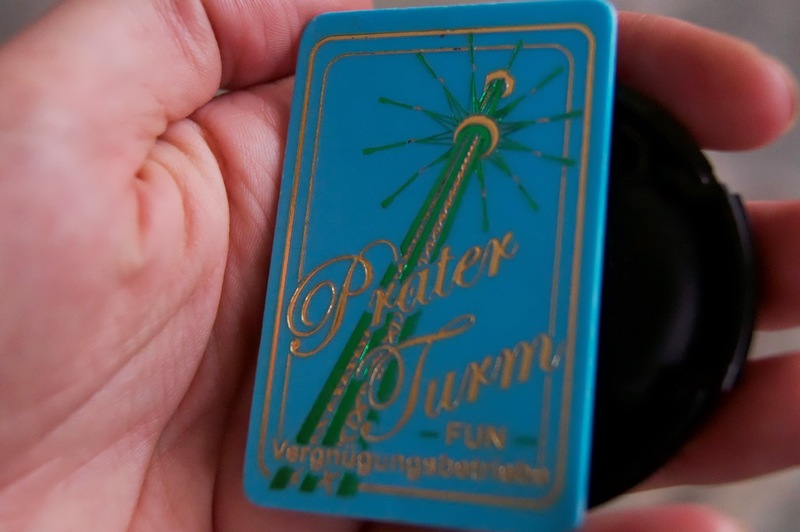 I have been to Prater Stern so many times because the Student agency bus stop is right across the street from it, and when I used to come from Czech Republic to do photo shoots with my friend for his photobook, that’d be where the bus dropped me off. 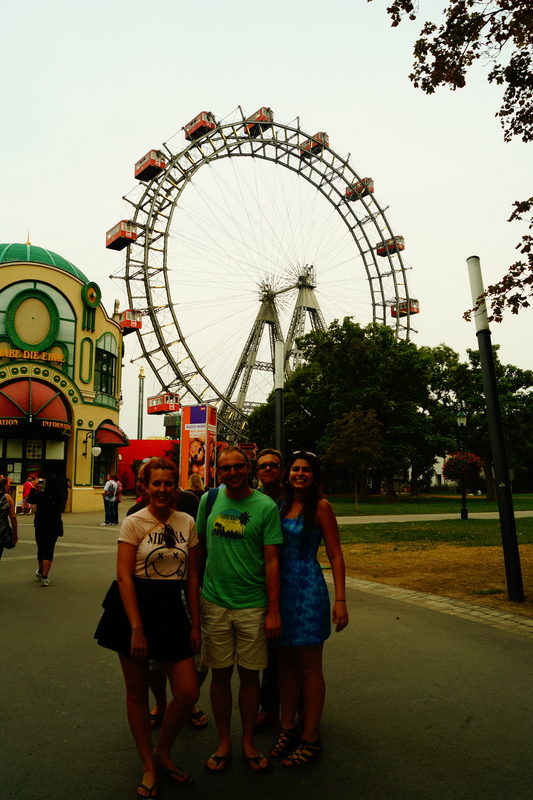 However, I still remember fondly the first time I ever went to Prater 2 years before when I was a rotary exchange student and visiting Rotary friends in Vienna. We went at night, which was visually awesome. I think Prater is best experienced at night. I love when all the rides are lit up at night -makes it feel that little bit more magical!! The statues and figures make for a scary stroll through as well. I find it very interesting how you perceive the city. 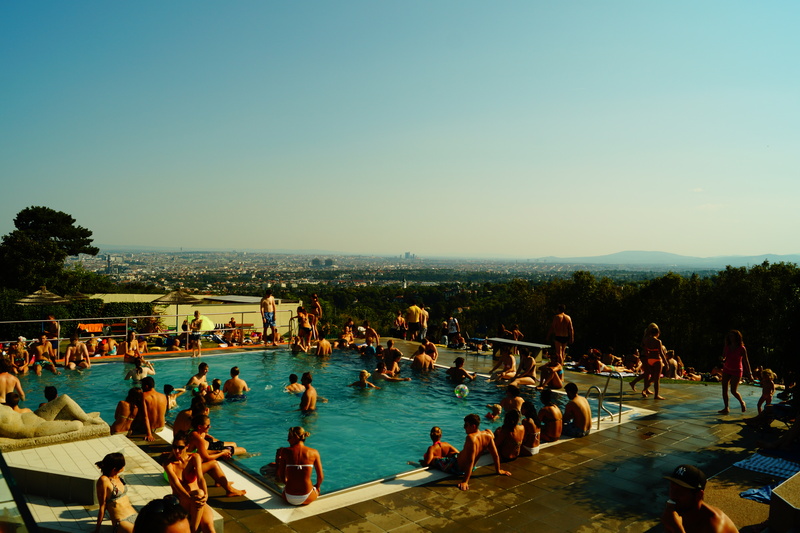 The Krapfenwaldbad is for most people in Vienna considered as something where the snobs and rich people go. I would never ever go there. It’s frowned upon by the normal folk. It’s something for the ‘better’ people, who drive expensive cars and live in the mansions nearby. No thanks. Also I find it interesting that you consider the graffiti at the Donaukanal as art. Viennese actually consider it as a ‘Schandfleck’ a shameful, ugly place, because of that ugly graffiti. We really don’t consider it as art, it’s really the opposite. I guess Viennese are as you said very much for being tidy and it really offends us when people just go along and paint random stuff on clean walls. I mean I do see the art in it, for example that big painting with the guy throwing a pine apple. But not like this, not with a bunch of sprayer tags and other ugly graffiti. And not on nice old walls like that. Your post about the Wachau really did it for me. I really never paid attention to the beauty of the country, now I really wish I had. If you ever go back to Australia, you should do the same, look at your country with the eyes of a tourist and appreciate the things you took for granted! Oh and your post about the 28 things, yup, just yup. So true, everyone of them. Thank you so much for the kind words Georg, I really appreciate it. 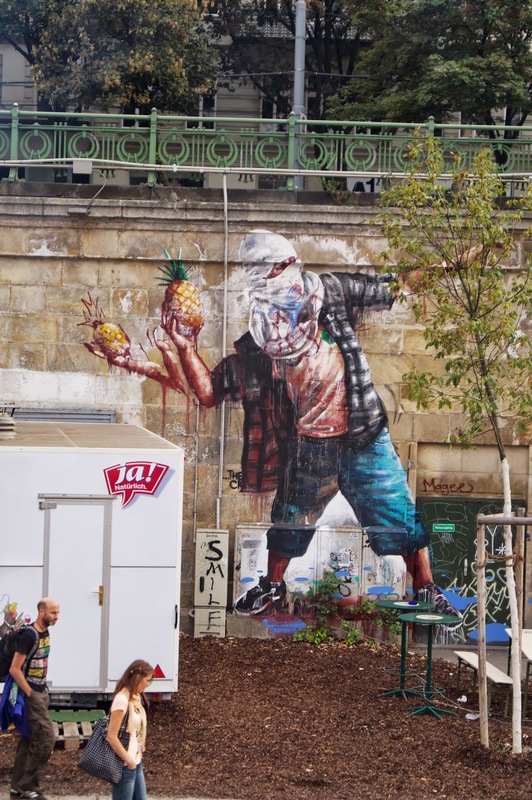 I guess coming from Melbourne street art has a different meaning for us – my ‘hometown’ has a different attitude to graffiti, but I think that’s what makes it so interesting to see in such a clean, classical city as Vienna!! I did see a lot of uh, ‘trendy’ people at Krapfenwaldbad too hahaha I think its maybe somewhere you go to a few times but not every weekend 😉 I’m glad the blog can help you feel a bit closer to home and really appreciate you reading. It definitely takes an ‘outside eye’ to appreciate the beautiful things of your own country so I’m glad I can help. I hope you’re enjoying your expat life in chilly Canada!